10:00- 10:30 TALENT: BELIEVE, WANT TO, CREATE. 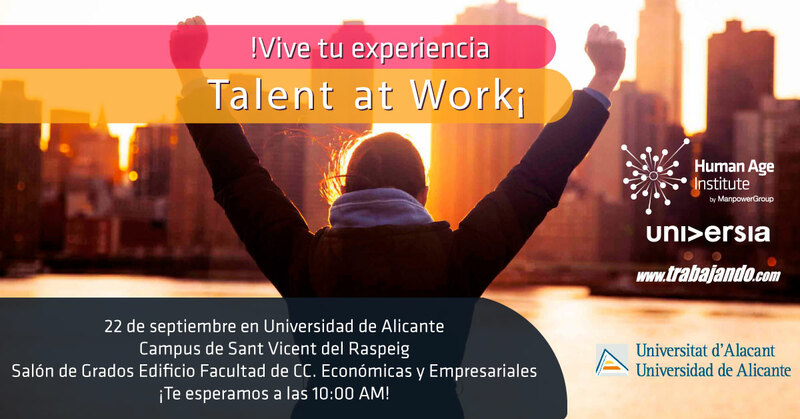 Juan Carlos Cubeiro, Head of Talent ManpowerGroup and Mentor of the area of Coaching of Human Age Institute. In a labour market like the current, are many the questions that concern you to the youngsters, one of the communities with greater number of unemployment. To give with these answers is necessary that know what look for the companies. Resolve these questions and contribute a practical vision of the current labour panorama is key to discover real opportunities. 10:30 %u2013 11:30 ¿WHAT WANT THE COMPANIES? Debate with Directors of Human Resources moderated by Juan Carlos Cubeiro. In full globalisation, where the competition has increased and purchased international dimensions and the technology and innovation dominate almost all the fields of the society, the companies explain us which are the profiles and the most sued competitions. 11:30-12:30 TOP TALENT practical Workshops that will give you all the tools that need to build your Personal Mark and orient you to tackle an interview of work successfully. 12:30- 14:00 ¡NOW YES! Will have the opportunity to receive personalised advice by part of professionals of the Human Resources on your professional future.